So, has Grigor Dimitrov finally arrived with his stunning victory in London over the weekend at the Nitto World Tour Finals? Last week, I wasn’t able to get in front of a TV for many of the group matches. However, as always I followed with interest and at first thought, I was a little surprised to see Dimitrov in the draw. Had he really had that good of a year to make the top 8 in the world and in doing so make the world tour finals for the first time? I then switched on the TV on Saturday to watch the Jack Sock semi-final and the commentator announced that Dimitrov will move to number 3 in the world with a victory today. Had he really had THAT good of a year!? This got the curious side of me going, so my ‘Resultina’ tennis app went into over drive that evening to find out more about this golden year for Dimitrov, as he seems to have gone under the radar. He started the year fantastically well with 2 victories in the first 3 events of the year (Brisbane and Sofia) and a semi-final appearance in Melbourne…Oh yes, it was all coming back to me, he did have a good year, didn’t he? Well, for the next 6 months of the year he had an average year. He went 15 wins and 13 losses in this period. And in the 3 Grand Slams since Melbourne he won 6 matches – an average of 2 per event. Great for many, but for a player who was tipped to be the next Federer? As the year moved into the hard court swing, he had an ‘outlier’ of a result given his previous 6 months by winning the Masters 1000 event in Cincinnati. Interestingly, after a disappointing US Open a couple of weeks later he took 5 weeks off competition – an important point of note to up and coming tennis players. He didn’t force his year. He recognised the need for rest and recovery as well as dedicated time to work on his game and physical development. The last 4 tournaments of the year brought 14 wins and 4 losses (2 to Nadal, 1 to Del Potro and 1 closely to the big serving John Isner indoors in Paris). Fair play to Dimitrov and his team who have kept him strong mentally and physically until the end of a gruelling year. The ability to be robust and durable is often a physical trait that is overlooked as a performance measure. Finishing with a 49-19 record (losing 30% of matches that he played) and he has had a breakthrough year finishing the year World Number 3. A great example of what our sport is about. You won’t win every match, you won’t have an amazing week every week, but your ability to roll with this and manage yourself through the year is critical to the success of a player. This is something that we really try to educate our players about here at SotoTennis Academy. The pattern that Dimitrov had in 2017 is a similar pattern to his career. Dimitrov shot onto the scene with his familiarity to Federer in technique and game style and his good looks. 2010 was a breakthrough year for Dimitrov, as he took the Challenger Tour by storm and ironically celebrated 2 wins at Futures level against David Goffin, who happened to be his opponent in the O2 finals this weekend! At this stage, comparisons were frequently being made to Federer, predicting Dimitrov to be the ‘next one’ to come through. Is this a realistic expectation that Dimitrov has not matched? Or are we guilty of applying these big statements to every player that shows some level of potential from an early age? After all, at a time when Nadal, Federer, Murray, Djokovic (Wawrinka, Del Potro) have been around we really have been treated to a golden era in the Men’s game. It has taken Dimitrov 7 years to finally reach the heights that so many expected. And I think this is perfectly normal! Maybe some don’t, but I believe it is another reality of our sport. It takes time to mature physically and mentally, to be secure in your game, to feel comfortable at each level (and believe me there are many layers to professional tennis even throughout the top 100) and many more. 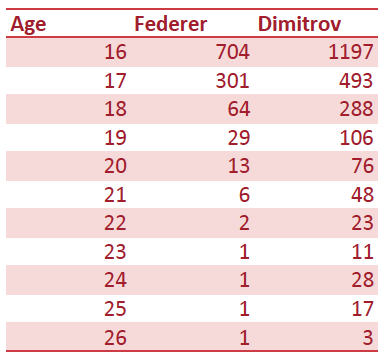 We can all speculate to what happened at age 24 for Dimitrov as ranking dropped from 11 to a year end 28, which is somewhat significant at that level. My guess is that he plateaued a little as he moved close to the worlds top 10 whether through lifestyle choices, ability to perform week in week out, ability to perform at Grand Slam level over 5 sets which brings a big challenge to many. Again this is normal. Not normal that the plateau comes at 11 in the world; Dimitrov is special, but for all players I have worked with at professional level, this is always a big one to watch. Players all get stale and have plateaus at certain levels. The ones who are prepared to make a change in their mind set, their training, whatever it may be are the ones who continue to get over those bumps in road and importantly they aren’t disheartened by this reality. So this brings us to the end of the 2017 season (bar Davis Cup final this weekend) and it begs the question. What happens in 2018? None of us could have predicted the way that 2017 has gone with the re-emergence of the ‘old men’ winning all 4 Grand Slams between them, or the long term injuries of the top 3 players in the world. So for me, 2018 is one of the most fascinating years yet as we have the blend of youth (Zverev, Kygrios, Thiem, maybe Dimitrov albeit he is 26), the old guard (Rafa and Roger), and the injury comebacks (Murray, Wawrinka, Djokovic, Raonic, Nishikori). Sit back and enjoy the ride! The only prediction to come from me is I think we may see the first slam for one of the #nextgen . Maybe the big man from Germany! ?